A former troubadour and privateer, who has risen to both the leadership of her House and to hold Great Office in the Crusader State - but her renown as a defender of her people's lives and traditions has put her at odds with the more radical, bloodthirsty, and land-hungry elements of the Crusade. During her disreputable youth a teenage marriage contract was terminated amidst a scandal, before she toured the Gulf as a troubadour. Comparative responsibility was achieved by undertaking one of the family professions and going to sea, though even there she served as a privateer rather than a 'conventional' naval officer. And her hedonism remained pronounced - her sole surviving child (and heiress), Nathalie, was born out of wedlock in 4985. Over time - and especially as more of her elders in the family died - she came to assume greater responsibility, participating in the failed defences of both Rabaq and Tyche (though in the latter, she helped to secure Taifa status for the Barony of Lattakieh), and the short-lived success of the Golden Season. Her current reputation is mixed: though a heroine to her people (and the participants of Count Joscelin's Crusade) for tying up a Kurgan army throughout 80 weeks of (unsuccessful) efforts to take the fortress of the Johburg from her, she is also known as a kinslayer - having killed one of her elder brothers after accusing him of treason and complicity in the Betrayal. Politically, she is a firm supporter of the Crusader State's laws and traditions, and is reputed to be devoted to her liege, Geoffrey de Moley. She also appears to have ties to the Imperial contingent on Yathrib (not least via the Imperial-administered refugee camp located on her land), and though she's been declared an enemy of the Chainer faction of the Muster (for supposedly opposing slavery) her family tends to have close relations to the guilds, especially in the Free City of Rotdam. Though she is at odds with the 'radical' wing of the Crusaders, she has been vocal in her support for the rights of the Inquisition - publicly clashing with both Sir William and his radical supporters over their efforts to usurp Inquisitorial powers. 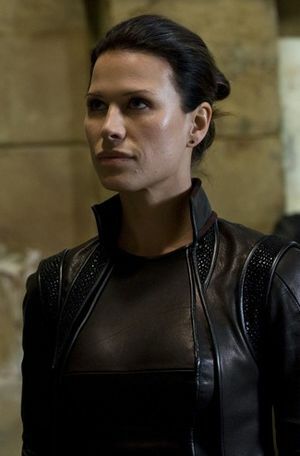 Personally, she has had great success in rebuilding her County from the results of years of occupation and combat, though it suffers continually from attacks from the two most potent Kurgan raiding fleets in the region, and the area of Teldam in particular remains an active target for renewed Kurgan expansion. Tall, elegant, and striking, she favours military uniforms, often wearing an anonymous grey one without insignia other than the House sigil, though formal dress uniforms are used for official occasions. Gowns are worn when she is acting solely as a social hostess, though with Johburg constantly under threat these instances of the Countess overtly setting aside her martial role are rare. Tanned, fit, and the beneficiary of at least a couple of anti-agathic treatments (rumoured to have been 'acquired' from an Hydessan al-Malik tribute shipment prior to their liberation from the Kurgans), she appears both much younger and more active than might be expected - by looks alone, she is far more likely to be taken for a thirty-something officer on active service rather than a mother in her late 40s. When she speaks, her voice is richly musical - a vibrant alto, only slightly roughened by years of command. This page was last modified on 31 May 2013, at 05:10.